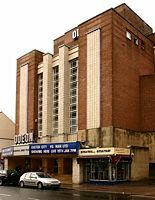 The Odeon in Sidwell Street is the oldest cinema, still running, in Exeter, and has been entertaining Exonians since 1937. Part of the Odeon chain from the beginning, the architect was Harry W Weedon who employed Robert Bullivant as a designer. Messrs Hewitt and Cherry of Exeter, were employed to negotiate the purchase of the site. Mr W P Wilkins was the builder of the cinema. At the time, much comment was made, that the new cinema was at the wrong end of Sidwell Street, and that a more central site should have been acquired. 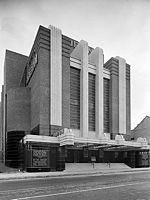 The exterior is immediately recognised as an Odeon cinema, with its three vertical windows between four ribbed columns. The modern facade still has flashing blue neon lighting running up the front of the building. With 1,176 seats in the stalls, and 744 in the circle, the interior was decorated with ribbed plaster work and fluted columns. 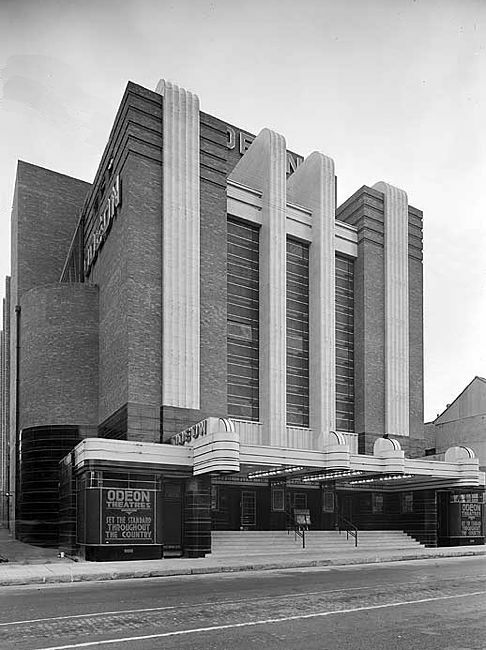 The cost of the cinema was £70,000, a large amount for the time with the construction taking 36 weeks. The Odeon offered an advanced sound system for the time, by British Thompson Houston of Rugby. In 1929, they were the first British company to manufacture 'talkie' projectors, at their Coventry factory. The company also supplied a system of earphones for the deaf, for which there was no charge. The first film to be shown was the black and white 'Charge of the Light Brigade' starring Errol Flynn and Olivia De Havilland, which opened on 30th August 1937. A large crowd gathered in Sidwell Street to watch the 200 guests arrive for the opening night. The National Anthem was performed before the cinema was declared open by A C Reed, accompanied on stage by Sir Edgar and Lady Plummer. The band of the 4th/7th Royal Dragoon Guards entertained in the interval. During the performance a collection was made for the Royal Devon & Exeter Hospital. This was all a little over a year since the ABC at the other end of Sidwell Street had opened. As a new cinema, special events would be staged for publicity - when the Technicolor Mikado opened in January 1939, Jean Colin, the star attended the first showing, and was presented with flowers on the front steps for the local paper to photograph. From the 1940's to 1964, the lounge area above the entrance hall was used as a restaurant. The cinema suffered bomb damage from the air raid on 4 May 1942, which closed it until temporary repairs could be made. The opposite side of Sidwell Street was totally destroyed. 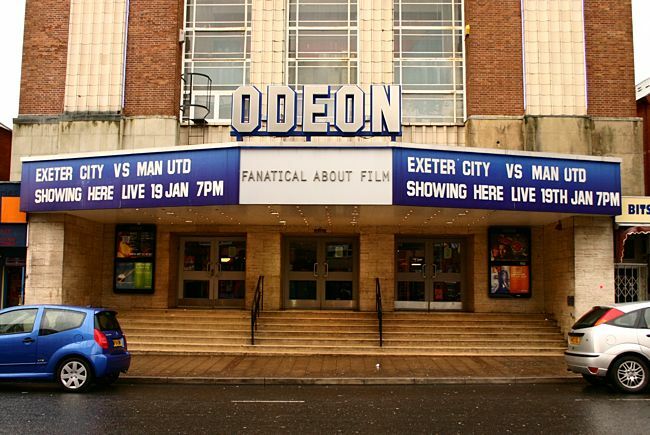 The Odeon was lucky to survive as Sylvia Hart remembers 'Exeter was not Exeter anymore. You could stand by the Guildhall and see the Odeon Cinema.' This was a distance of almost ¾ of a mile of devastated High Street and Sidwell Street. The cinema was not fully repaired until 1954. The steps in the front entrance of the cinema still show damage from a bomb blast that scattered shrapnel across Sidwell Street. In November 1942, Cliff Gwilliam was appointed as manager, replacing Harry Clare. In 1945, Gwilliam would become the manager of the Theatre Royal, a position he would hold until it closed in 1962. The Odeon also put on talent shows, in the interval, between the B and main feature, for locals and servicemen to perform on the stage. The cinema would routinely entertain twenty wounded service men every Saturday, free of charge. Devon's Home Guard had training films screened at the Odeon. The cinema was also used by the Battalion for Church Parade, presumably because the Cathedral was undertaking repairs. In fact, the Odeon was also used for a Special Concert, when the Band of the Devonshire Regiment played a programme of music, raising £60 for the Battalion Commander's Fund. On Sunday 16 May 1943, the City Council presented the Battalion Flag to the 1st (Loyal City of Exeter) Battalion, Home Guard at the County Ground. 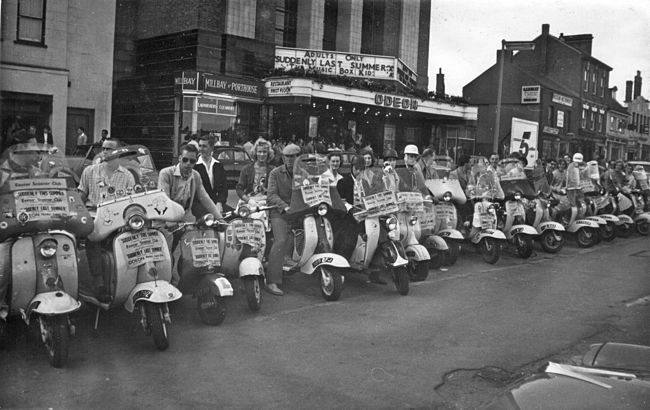 The event was filmed by British Gaumont News who quickly edited it for showing the next week at the Odeon. After five years of war, the Odeon, along with other cinemas, opened their lighting onto the street, as the blackout was eased in September 1944. 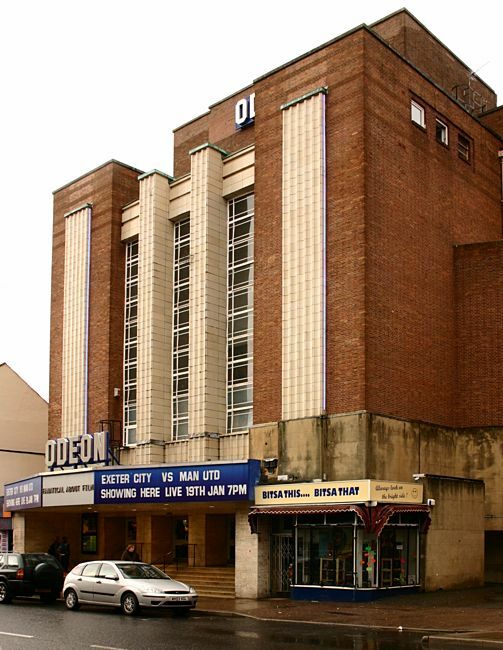 "A deplorable example of a complete lack of consideration in this is shown in the way the new Odeon Cinema has been allowed to dominate the city by piling its great hump-backed mass on the summit of the Sidwell Street ridge - a shapeless lump of a building which rides the city like a totalitarian mammonite cathedral". What he would think of the Debenhams (John Lewis) building is probably unprintable! I also promise to come to the cinema lots." "Every Saturday morning, Where do we go? Getting into mischief, Oh dear, no! Join the Mickey Mouse Club, This will be our song, Every Saturday morning at the Odeon." An advert from 1962 shows the cinema promoting its Saturday morning show for children as the 'Odeon Boys & Girls Club'. Shows started at 9.30am and cost 6d and 9d. The programme consisted of cartoons, serials, comedies, interest and feature films. An advert appeared on the screen in which a child appeared and asked the viewers "are you going to Sunday School tomorrow" to which the kids all screamed back "NO". They even laid on buses to take the children home. In 1972, the cinema was divided into three screens of 742, 119 and 118 seats respectively. A fourth screen of 344 seats was added in 1988. It now has a capacity of 1312. The Odeon was the only large cinema chain outlet in Exeter until Vue opened in December 2006. 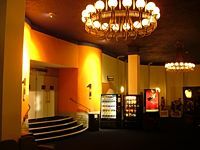 During the previous few years, the Exeter Savoy Cinema (ABC) had put on live shows with some popular pop acts. The Odeon decided to stage its own live shows and spent £6,000 on new dressing rooms and enlarging the stage. The Rolling Stones gave the first show on the new stage on 2nd October 1964. See Onstage with the Stones and the Stones at Exeter. 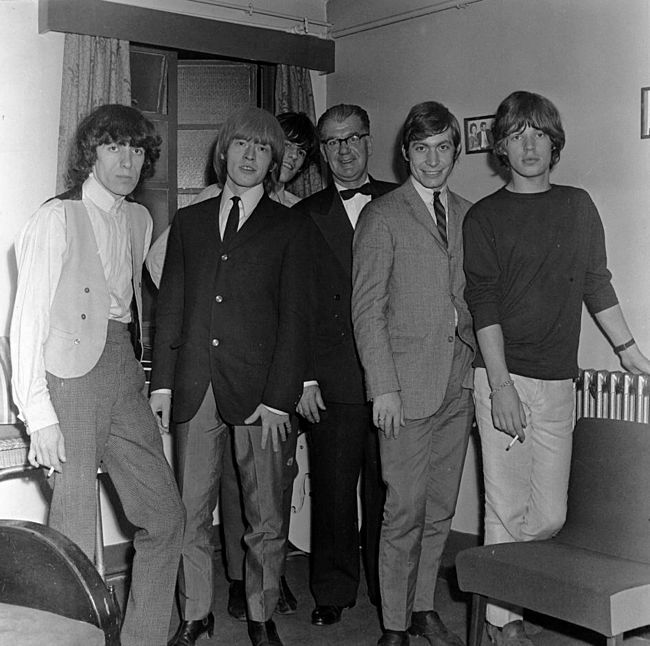 They performed again on 16th July 1965 along with the Walker Brothers and Rod Stewart. 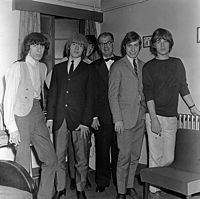 Other acts in the sixties include Dusty Springfield, Hermans Hermits and Brian Poole and the Tremeloes. 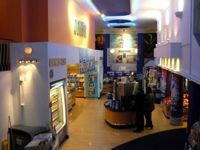 The cinema has also shown live, large screen events, the most recent of which was Exeter City v Manchester United on 19th January 2005 when 700 cheered on the Grecians. Sources - The websites albanyward.com, cinematreasures.org, Exeter Phoenix by Thomas Sharp, Sylvia Hart and The Exeter Schools' Octocentenary Celebration brochure from 1962. The Express and Echo, Exeter and Devon Gazette, the Western Times and memories of visitors to the site. 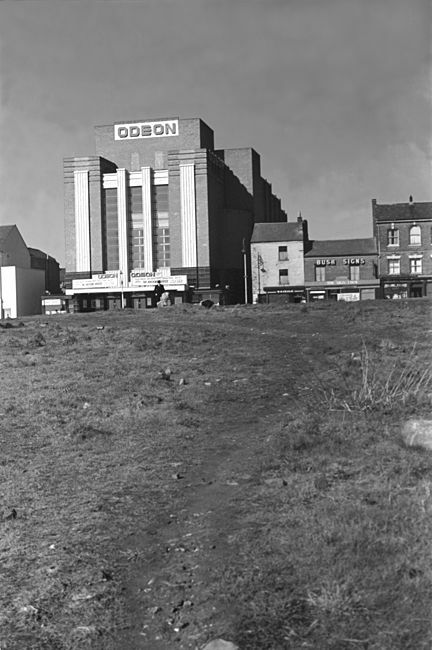 The Magnificent Odeon façade when first built. The Odeon from a bombed out Sidwell Street, 1949. Photo © Maurice Swansborough. 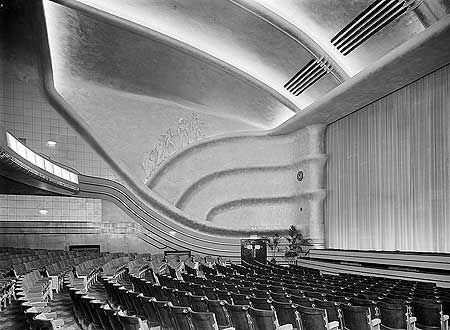 Interior of the Odeon 1937. 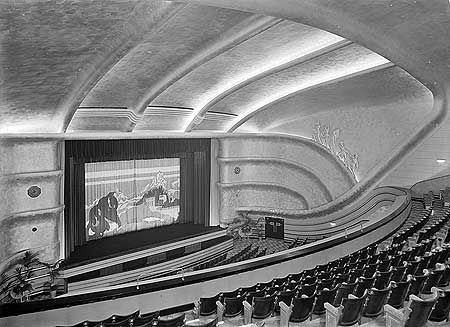 The screen of the Odeon, 1937. 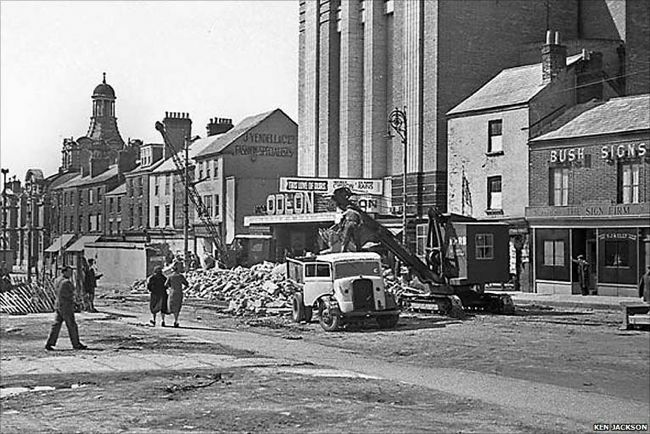 Removing the bomb damaged shelter in front of the Odeon in 1942. The modern façade when Exeter City V Manchester United was shown live. The modern exterior of the Odeon. The entrance foyer and ticket counter circa 2008.